No. 4 seed Ann Li came into her Girls 18s Clay Court Championships semifinal match with Chiara Lommer having lost only ten games in her five victories. Down a set and a break to the unseeded Lommer, Li tapped into the energy reserves those routine matches allowed her to store, came back to post a 4-6, 7-6(5), 6-4 win. Lommer was down a break twice in the opening set, but each time the 17-year-old from Illinois immediately broke back, playing aggressively and winning most of the backhand battles. After holding for 5-4, Lommer broke to take the set, with Li making two backhand errors after saving one set point. "She was steady from the baseline and I was, in the first set, maybe trying to do too much," Li said. Down 3-1 in the second set after being broken at love, Li did what Lommer had done in the first set, getting the break right back when Lommer made a few rare unforced errors. Li then began to hold serve more easily, while Lommer had to win lengthy service games to stay ahead, including saving two break points at 5-5. In the tiebreaker, Li went up 4-2 and 5-3, but Lommer pulled even when Li netted a backhand after a long rally for 5-5. Li held with a big forehand forcing an error to earn a set point on Lommer's serve, and she converted it when Lommer's backhand went wide. Although just two points from a loss, Li didn't show any sign of nerves. "I'm actually a pretty calm person usually," said the 16-year-old from Pennsylvania. "I just tried to breathe, stay calm and positive. Not focusing on the past, but on the right now. Being confident in yourself, I think it helps a lot." During the 10-minute break between the second and third sets, Li phoned her coach Jon Glover, who recently joined the USTA as a National Coach. "It was mostly about me," said Li, who also works with USTA coaches Erik Kortland and Jay Devashetty in New York. "I was trying to mix up my shots and get into the net." The third set opened with two breaks of serve, but five straight holds followed. Serving at 3-4, Lommer saved two break points, while Li rode her forehand to an easy hold in the next game to make it 5-4. Li's pressure extended into the next game, with a backhand forcing an error and a forehand return winner making it 0-30. Lommer netted a forehand after a long rally to give Li three match points, but two netted forehands had her down to her last one. Lommer got her first serve in, but Li was ready and sent a good deep return to the baseline. Lommer couldn't quite get set for it and hit her reply wide to end the two-hour and 40-minute match. "After two, I said, I need to get this one right now," said Li. "I don't want to drag it out any longer. I had to put it all out there, but fortunately, it wasn't too hot and it was pretty cloudy, so I'm lucky I had that energy." Li will play Amanda Meyer in Sunday morning's final, their first meeting, after Meyer defeated fellow No. 9 seed Isabella Lorenzini 6-4, 6-3. Meyer started well, taking a 3-1 lead in the first set, but lost three straight games. Lorenzini was unable to capitalize on the change in momentum however, with her serve going off at that crucial stage in the set. She double faulted twice in losing serve at 4-3, and after Meyer held for a 5-4 lead, Lorenzini double faulted three times, including on set point, to give Meyer the set. In the second set, Meyer trailed briefly at after getting broken at 1-1, but won three straight games and never trailed after that. In the final game, Lorenzini missed an easy forehand putaway that would have given her a break point, instead giving Meyer a match point, which Meyer converted when Lorenzini netted a forehand. Meyer said that both she and Lorenzini returned well, accounting for most of the breaks in the match, and she also detected a change in strategy from Lorenzini in the second set. "Her return was really solid," said the 17-year-old from Florida. "She tried to hit it higher, I think. I felt like I adapted to that. But overall, it was mostly the returns. I put a lot of pressure on her serve, and I think that made the difference." Meyer, who won the Bobby Curtis Florida Closed last month, detailed the improvements in her game, which she said have been mostly on the mental side. "Focus, concentration, staying in the point," said Meyer, who is coached by Mandy Wilson at the Evert Academy in Boca Raton. "Having a presence on the court. That's what my coach really puts emphasis on, the mental part of the game." Neither Li nor Meyer have played in a USTA Level 1 singles final before, but Meyer is not concerned about that. "I'm just going to go out and play," Meyer said. "It's my first final, I'm going to enjoy it, go out and play my game. Just savor every point." Li may be playing in her first singles final at a USTA major championship, but she will go for her second consecutive Clay Court doubles title when she and Anna Brylin, the No. 3 seeds, play No. 2 seeds Elysia Bolton and Abigail Chiu. 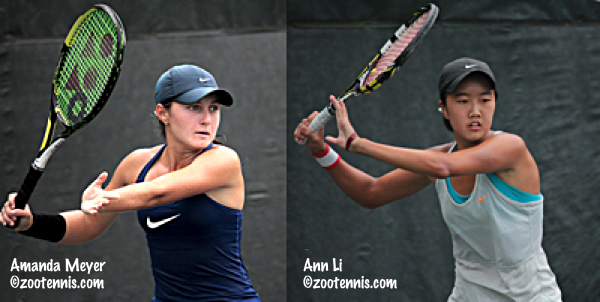 Li, who won the 16s doubles title at the Clay Courts in Virginia Beach with Natasha Subhash, and Brylin, who was in that final against Li and Subhash with partner Clarissa Hand, defeated top seeds Lexi Milunovich and Anna Rogers 6-4, 3-6, 6-2. Li and Brylin won the bronze ball at this year's 18s Winter Nationals, their only other tournament as a team. Bolton and Chiu advanced with a 4-6, 6-2, 6-4 win over No. 4 seeds Lommer and Victoria Flores. Bolton will also play in the consolation singles final, taking on Nami Otsuka. For draws, see the Tennis Link site. The finals are set for the girls 16s and the boys 16s and 18s after today's semifinals. In the girls 16s, Alexa Noel will go for her second straight Clay Court singles championship. The 2015 14s winner, seeded 17, will play No. 5 seed Amber O'Dell Sunday in Virginia Beach. In the boys 16s, Jenson Brooksby, the No. 14 seed, will face No. 7 seed Lukas Greif. In the boys 18s, unseeded Sebastian Korda will play No. 7 seed Alexandre Rotsaert, who also reached the 18s final last year in Delray Beach, losing to Sam Riffice. The champions were decided in the 12s and 14s divisions today. No. 9 seed Christine Canete defeated No. 17 seed Ellie Coleman 6-1, 6-1 to take the girls 14s title in Plantation, Florida. Canete won the Winter National 12s in January. No. 9 seed Zane Khan defeated brother Faris Khan, the No. 7 seed, 6-4, 6-4 to win the boys 14s title in Fort Lauderdale, with the twins also capturing the doubles championship. Khan defeated Faris for the 12s Clays and Hard Courts National titles in 2014. No. 6 seed Katja Wiersholm, sister of Virginia's Henrik Wiersholm, won the girls 12s title in Boca Raton, beating No. 2 seed Robin Montgomery 7-6(5), 0-6, 7-6(4) in the final. Evan Wen, the only top seed to win a singles title at the Clays, defeated No. 6 seed Victor Lilov 3-6, 6-4, 6-4 to win the boys 12s in Mt. Pleasant, South Carolina.